Hyundai has pulled the covers off its all-new 2018 Veloster and Veloster Turbo cars. 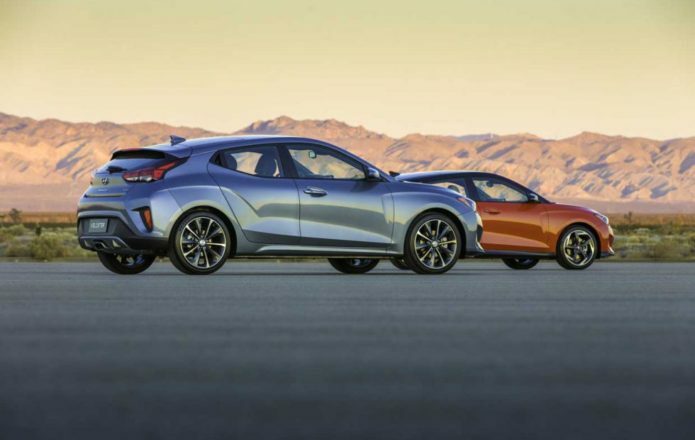 While the models are all-new, they retain the style and feel of the original Veloster along with the two-plus-one asymmetrical body configuration that made the cars so interesting to start with. Hyundai says that the new Veloster 2.0 with a manual transmission starts at $18,500. For 2019 the interior and exterior of the cars is all new and Hyundai says that production of the Veloster started in March 2018 in Korea. Among the changes for 2019 on the outside of the car are available LED headlights and LED daytime running lights. The grille design is new, and the car has functional air curtains on the front. Hyundai says that the new shape is meant to convey focused dynamic performance with a more muscular stance than the outgoing model. The new car has higher volume fenders and wheel arches and rolls on available 18-inch wheels. Buyers can opt for a darkened roof treatment. The base 2.0 model gets a single outlet exhaust out back while Turbo and R-Spec versions get dual outlets. Inside the car has 19.9 cubic feet of cargo space and comes with new colors and textures for interior trim. Base Veloster cars get a 2.0L four making 147hp and 132 lb-ft of torque mated to a 6-speed manual or 6-speed automatic. The up-level versions get a 1.6L turbo four making 201hp and 195 lb-ft of torque. Overboost brings torque to 202 lb-ft. The Turbo gets a 6-speed manual standard with a 7-speed dual clutch available. R-Spec buyers get a manual with a late availability B&M Racing sport shifter. Turbo and R-Spec models also get special suspension tuning for sporty feel and handling. All versions get standard forward collision avoidance, eyes Free iPhone integration, and available Qi wireless charging, 8-inch display, and nav. The top of the line Turbo Ultimate DCT will cost $28,150 with the R-Spec manual selling for $22,900.